The rare earth stocks exploded on the scene in December 2010 when they spike higher during the holiday season. The sector that produces lithium, beryllium, indium, gallium, neodymium, and terbium continues to hold up well on the charts at this time. Molycorp Inc. (NYSE:MCP) seems to be the leading rare earth stock in the sector. This stock remains in a choppy sideways base on the daily chart. The stock is trading above all of the major moving averages which puts the stock is a strong uptrend and a good technical chart position. This morning Molycorp stock is trading higher by $4.40 to $76.00 a share, which is a new 52 week high. 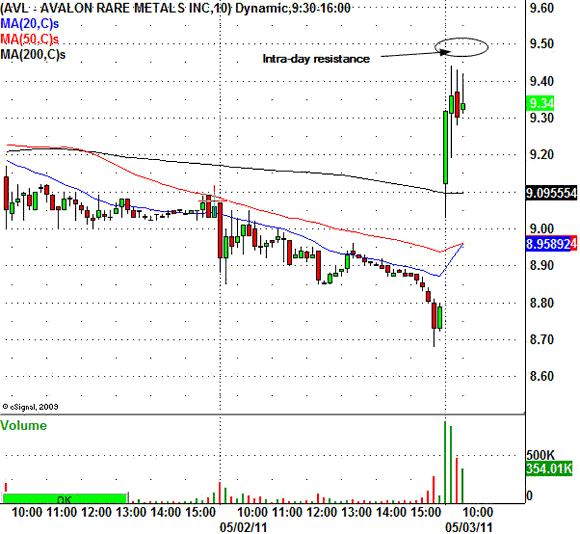 Avalon Rare Metals Inc. (AMEX:AVL) is another leading rare earth stock that is trading higher this morning by 0.57 cents to $9.40 a share. This stock is trading in a loose sideways base on the daily chart. This type of pattern could trade higher, however, loose consolidation patterns have a tendency to fail sometimes and break lower. Intra-day the stock will have intra-day resistance around the $9.55 area. Should the stock rally higher the next resistance area would be around the $10.00 level. Rare Element Res Ltd. (AMEX:REE) is another leading rare earth stock based out of Vancouver, Canada. This stock has made a lower high pivot on the daily chart and this is a sign of likely weakness. However, a close back above the $15.53 area would put the stock in a strong technical chart position. This morning REE is trading higher by 0.76 cents to $14.61 a share. Short term traders must watch for resistance around the $14.85 and $15.10 levels. These are two short term levels where the stock could see some intra-day selling pressure. Nicholas Santiago started trading in 1991. In 1997, he became a licensed Series 7 and 63 registered representative. He managed money for a large, affluent private client group. After applying his knowledge to his client base, he decided it was time to begin teaching those interested in learning his methods. He is an expert in Technical Analysis. He has become an accomplished technician in the studies of Elliot Wave, Gann Theory, Dow Theory and Cycle Theory. In 2007, he partnered with Gareth Soloway to form InTheMoneyStocks.Com and realize his dream of educating others about the truth of the markets.